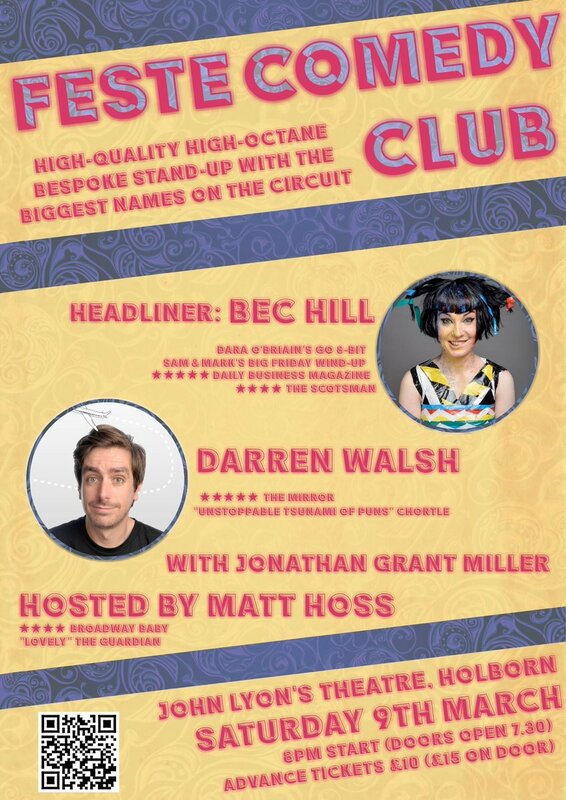 Welcome to Feste Comedy Club, Holborn's new premier comedy club. We're in the luxurious John Lyon's Theatre in the CityLit Building to offer you a night of truly hilarious comedy. We offer more than just basic club comedy, we have personality and carefully chosen acts for the bill. This is a high-quality, high-octane and bespoke stand-up comedy show with the biggest names on the circuit. ★★★★★ "Hill serves up a delightful menu of comic genres"
Tickets are only £10 in advance or £15 on the door. Doors open at 7.30pm. Show at 8pm. No late-comers admitted.